Vejar Elementary students participated in the 2014 Mt. SAC Relays on March 22. 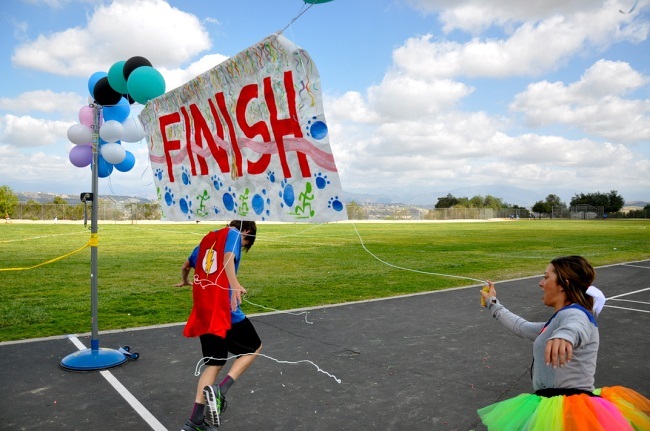 The runners proudly showed determination and skill during the annual race day. Fifty-five members of the school’s Track Team practiced for several weeks before the big day. 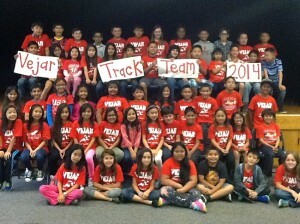 And they wore special red team t-shirts during the track and field events held at Hilmer Lodge Stadium in Walnut. “All our students did a great job,” said Principal Jennifer De Anda. Every participant wins pins and ribbons at the Mt. SAC relays. Parent volunteers helped pass out water and energy bars during the event. The kids enjoyed pizza and hamburgers when they were finished. A special thanks to the numerous coaches and parent volunteers for their commitment to the team and to local business that donated snacks and food for the young athletes. The Rowland Unified School District is seeking input from the community on the educational priorities to be included in its Local Control Accountability Plan, which ensures that funding is targeted to the needs of all students. Community members are encouraged to take part in the LCAP Survey available through March 31. To participate in the online survey (also available in Chinese and Spanish), the community can visit the “Your Voice” section of the District website www.RowlandSchools.org and on every school website. Hard copies will also be available at each school site. California school districts now have the flexibility to prioritize resources in order to meet the specific needs of its student populations with a new funding formula. The new method of funding public schools is called the Local Control Funding Formula (LCFF). The LCFF has been passed by state legislation to allow local insight and meaningful conversations to take place between parents, employees and the community about their schools. The advisory process began on March 6, 2014 when 25 stakeholder representatives met to receive an overview. They included PTA, community members, students, teachers and principals. Materials shared at the meeting can be found on the District website www.RowlandSchools.org under Local Control Funding Formula – Unified for Excellence. The Rowland Unified LCAP Advisory Committee will review the survey results and use the information as they develop the draft of the Local Control Accountability Plan. Stakeholders’ recommendations will be compiled in a report that will be provided to the Board of Education. After a public hearing, the governing Board of Education must review and approve the RUSD Local Control Accountability Plan in June, 2014. 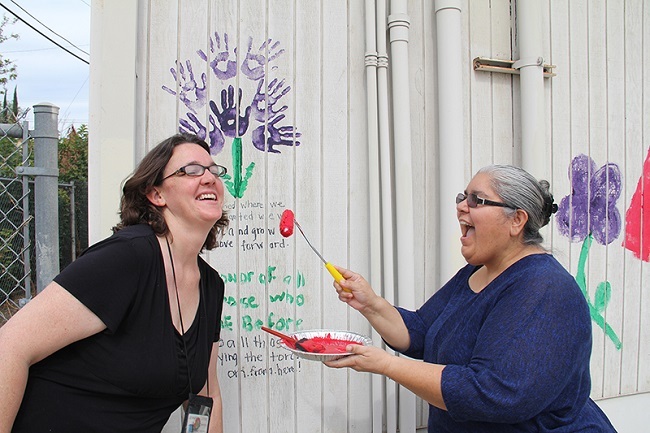 Family Resource Center Coordinator Jennifer Kottke, left, and Community Liaison Irma Almanza have fun saying goodbye to old portable by painting it before it is torn down. It’s been 35 years, but the Family Resource Center and medical clinic in La Puente is finally getting a new building. Rowland Unified broke ground for the new facility this week next to Northam Elementary. Bulldozers have already demolished the two old trailers used by the dental and medical clinic, as well as the district family resource staff. Everyone is looking forward to moving into the new 3,200 square-foot facility this summer. The modular building will allow the district to expand its services to students and their families. “I’ve been dreaming of having our own building for the past 35 years,” said Jane Rosser, director of the Children’s Dental Program. Rosser remembers the clinic opening in an old Army trailer. She jokes about holes in the roof that would let the rain drip in. Later, the dental program moved into a much larger trailer where it served thousands of children in the La Puente area. The district’s dental clinic still serves more than 600 students a year. It offers low or no-cost screening and treatment services for low-income students. “We help a lot of single parents, as well as large families whose parents already work two or three jobs to support their children,” Rosser said. She and dentist Lester Lim are very excited about the new building. It will have two dental treatment rooms, with a third room for expansion later. Next door, the medical clinic will have its own new home. The clinic provides free immunizations. It also offers medical care on walk-in basis to uninsured, low-income children 3 to 18 years old. Eighth grader John Dempsey was the Fun Run winner in third Period during the Fun Run. 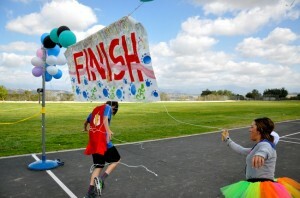 P.E Teacher Cameron Silvas met him at the finish line for a silly string celebration. South Pointe Middle School students grabbed their tennis shoes and took to the track during a Fun Run held today. Students ran during their Physical Education classes throughout the day. Most wore their gym clothes, while other dressed up in crazy costumes with super hero capes, ballerina tutus, leopard tights and hot pink wigs during the first-time fitness event. The 1½ mile-course took runners around the grassy field, through the gym, and then looped back to the field and to the finish line. The South Pointe Panthers competed for engraved 1st Place trophies and best costume prizes. Teachers joined the fun with water spritzers and giant bubbles at stations around the course. The Art Department designed signs and the school band played during morning classes. Sixth grade friends Juhi Doshi, Itzel Cavral and Ariel Cardona dressed up in tutu outfits for the Fun Run. “It was long, but it was really fun!” Cardona said. “Run, run, run and finish strong!” encouraged P.E. teacher and organizer Cameron Silvas as students crossed the finish line. “There are just so many adult runs on the weekends, I thought why not bring it here?” Silvas said. Next year she plans to host a Color Run at the school where teachers throw colored powder at students as they pass stations. “When they cross the finish line they’re a rainbow!” she said. The Los Altos Academy of Engineering is preparing for an electric vehicle contest in Florida on April 26. The young engineers plan to race three vehicles in the Emerald Coast Electrathon. The Los Altos High School team needs $11,000 to cover expenses to Pensacola. They hope the community will adopt a high school engineer by contributing $10 or more. For more information, call 626-330-1096. Rowland teachers have declared an impasse in the stalled contract negotiations with the Rowland Unified School District. The Association of Rowland Educators is asking the state to send in a mediator to handle further negotiations. “We’re filing the paperwork now to declare an impasse with the state,” said ARE President John Petersen on Monday. Union officials say the contract talks broke down during the eighth bargaining session last Thursday. In an email to teachers, Nadine Loza, bargaining chair, explained what happened. District officials were surprised by the sudden impasse, but they say they remain open to fair negotiations with the union’s 700 members. “We’re still committed to negotiating with them in good faith,” said Superintendent Ruben Frutos. Both sides say pay raises remain the largest stumbling block. The teachers want a 10 percent pay raise next year, the district has offered 2.5 percent the first year and 2 percent the next. Rowland Unified had originally offered a 3.5 percent raise, 1.75 percent the first year and the same the second year. Rowland teachers have declared an impasse in the stalled contract negotiations with the Rowland Unified School District. The Association of Rowland Educators is asking the state to send in a mediator to handle further negotiations. The state steps in when regular negotiations break down. “We’re filing the paperwork now to declare an impasse with the state,” said ARE President John Petersen. Union officials say the contract talks broke down during the eighth bargaining session last Thursday. In an email to the teachers, Nadine Loza, bargaining chair, explained what happened. The teachers’ representatives say they declared a impasse and cancelled the next bargaining session set for Thursday. “There’s a backlog for mediators, so we don’t expect the state to assign one for at least six weeks,” Petersen said. This mediator will meet with both sides to try and work out the differences. Petersen insists the bargaining teams will not meet until the state assigns a mediator. The Rowland Unified school board on Tuesday officially began the process of finding a new leader for the 14,500-student district — possibly the first time in its history such a search has been orchestrated. Such a move is a reversal from a decision made one year ago to appoint business manager Ruben Frutos as superintendent. The surprise appointment precipitated protests, pickets and demands from teachers, parents and community members to hold a proper search for a new superintendent. That demand was met Tuesday, when the board directed its staff to bring a list of consultants forward at a special board meeting set for April 17. At the upcoming meeting, the board will hear pitches from search firms and pick one to begin gathering resumes. “This is important work. I will cancel what I was to be speaking at. We need to get this done,” said board President Heidi Gallegos, who cleared her schedule in order to attend the special meeting. At least four executive search firms have already answered a request sent out by the Rowland Unified School District more than a week ago, announced Douglas Staine, RUSD assistant superintendent for human resources. While he couldn’t guess how many firms would apply for the work, Staine said it could be more than 20. They have until Friday. Only a firm with experience helping a school district pick a new leader will be considered, Gallegos said. “A professional firm should have experience, particularly with good community engagement,” she said after the two-hour meeting. Once a consultant is chosen, the firm will work directly with the board in gathering resumes and soliciting input from teachers, parents and community members, she said. She wants to see the community be able to directly email the search consultant with questions or suggestions, she said. Rowland teachers have declared an impasse in the stalled contract negotiations with the Rowland Unified School District. The Association of Rowland Educators is asking the state to send in a mediator to handle further negotiations. District officials were surprised Tuesday by the sudden impasse, but they say they remain open to fair negotiations with the union’s 700 members. Staine estimates a 10 percent raise would cost the district $6.7 million a year in additional payroll. The director of human resources noted that salaries already consume more than 85 percent of the district’s yearly budget. The teachers’ union says Rowland’s instructors are paid less than other school districts. They say they only want parity. Beginning teachers with a bachelor’s degree and no experience earn an annual salary of $45,180 at Rowland, which is ranked 18th out of 47 school districts in a salary survey from the Los Angeles County Office of Education for 2012-2013. District officials say such comparisons are misleading because the vast majority of their teachers are at the top end of the pay scale. When asked for a salary analysis, they provided this information. More than 20 percent of Rowland instructors earn $80,000 to $90,000 a year. They would get close to $9,000 more with a 10 percent raise, bringing them to almost $100,000 a year. 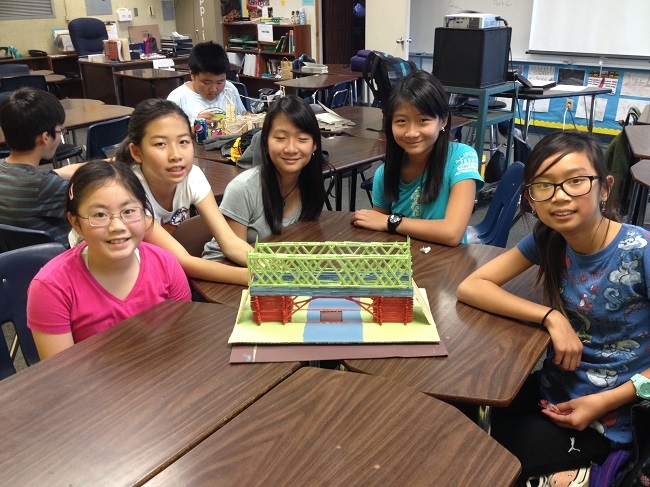 Chaparral Middle School GATE students raced to build toothpick bridges during a competition held on March 6. 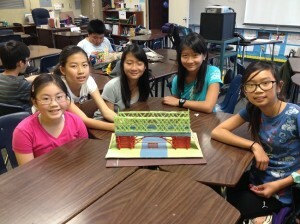 The group of gifted 6th, 7th and 8th graders is part of the after-school Bridge Design and Engineering class. Chaparral 7th grade Language arts teacher Heather Finch serves as the GATE coordinator. “The class worked very hard in preparation for the challenge during the past 12 weeks,” Finch said. The four-member teams managed their own budgets to buy supplies, including land (cardboard), lumber (toothpicks), welding equipment (glue), and paint. It took 15-20 hours to complete the detailed structures. Students had to communicate as a team in order to overcome strict time constraints. Prizes were awarded for strongest truss bridge and for creative design. “Our goal was for the bridges to hold 150 lbs., and our winning bridge ended up holding over 250 lbs.,” Finch said.